National Guard troops were dispatched in Frankfort at the beginning of the war to protect bridges, train tunnels, factories, and water supplies. The fear was that German spies would sabotage or disrupt the transportation of materials and the mobilization of troops. The NLWS Canteen Department found that the Company, encamped at the Old State Capitol, was receiving only half the rations as the Signal Corps stationed at the New State Capitol. 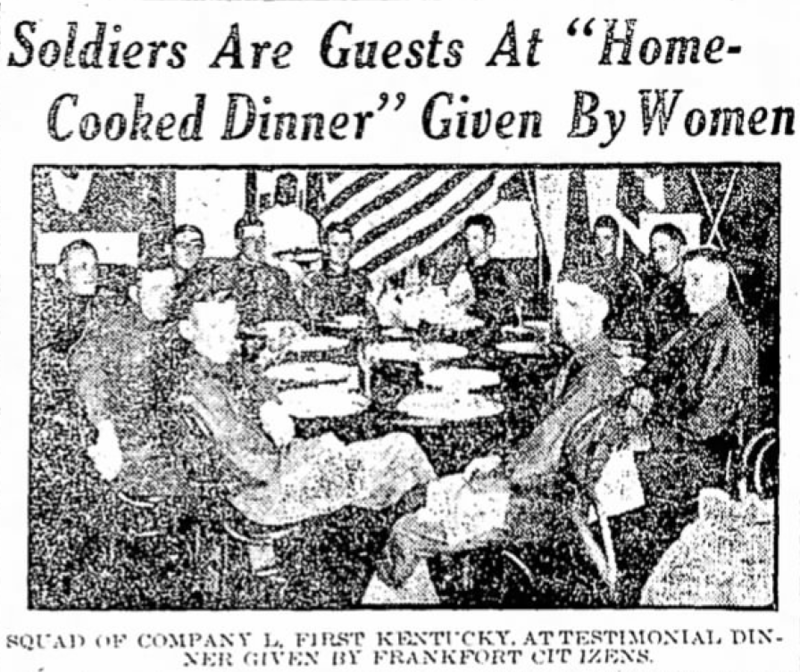 Desiring to rectify the situation, Scott and other women in Frankfort began hosting dinners in their homes for soldiers. Liberty Hall garden was the venue on multiple weeks. In addition to being the site of meals served to soldiers, Liberty Hall garden was also the backdrop for a home front film made in July 1917. Little is known about the film except that it recorded one of the meals and the making of trench torches. It was to be shown across the United States and possibly sent to France where the “Poilus,” or French infantry soldiers, might have an opportunity to see it. The instructional film documented every step in the torch making process. In locations close to the battlefield where lighting systems were destroyed, such torches made it possible for doctors and nurses to carry on their work of saving injured soldiers. Today the whereabouts of the Liberty Hall trench torch film is a mystery, but the Library of Congress confirms that in November of 1917 Paramount Pictures Corp released a couple of short films called pictographs which featured children and adults rolling long strips of newspaper into candles or torches which were then tied with string and dipped in paraffin. It may never been known if these were the Liberty Hall films because they have not been located in any archive, but the timing of the release, some three months after the activity was filmed in Frankfort, makes it entirely possible. The Paramount pictograph format is also consistent with the film’s supposed wide distribution. While the torch making activities at Liberty Hall were carried out under the umbrella of the NLWS, members had crossover involvement with other social organizations. At least three of the women were members of The National Society of The Colonial Dames of America in The Commonwealth of Kentucky, including Margaretta Brown Barret, Mary Mason Scott's aunt, and Annie and Emily Thomas. Scott became a Dame several years after WWI. In Louisville, NSCDA-KY dedicated the winter of 1915 to war relief. Between November and the following April the War Relief Committee solicited donations for hospital supplies and made over 40,000 bandages for the Red Cross to distribute in Europe. In addition they asked tobacco growers and dealers to donate product for troops in the trenches and in hospitals. 4,000 pounds was collected and sent to the French government. They also equipped seven motor car hospital rooms operating on the battlefields. 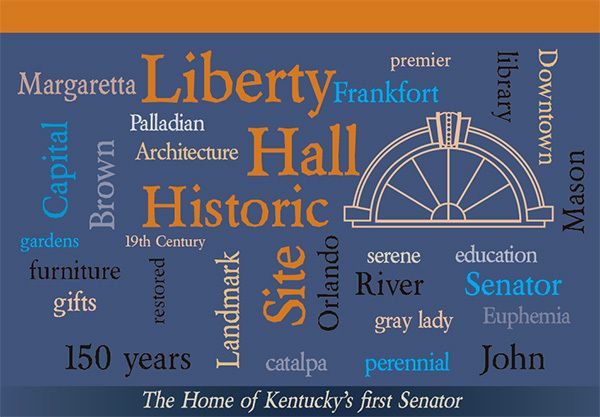 Liberty Hall Historic Site is a property of The National Society of The Colonial Dames of America in The Commonwealth of Kentucky. Liberty Hall Historic Site makes news! View articles to learn about partnerships and projects in the spotlight. Get weekly updates and learn interesting tidbits by becoming our friend on Facebook. If you wish to donate items or services to Liberty Hall Historic Site, please see our Wish List!